Joking aside, your eyes do age, and as they do so, some things become more difficult. For me, one of those difficulties has been picking up my iron sights, especially when they are the unrelieved black such as those found on my recently purchased Ruger LCP. On my first trip to the range, I was convinced that something was terribly wrong with the gun or perhaps the ammo, until Son was able to take the same gun and ammo and shoot a respectable group with it. While I did have the foresight to purchase the version with the Crimson Trace laser, I really would like to see those sights. Previously, I have used various colors of enamel paint (such as Testors modeling paints) in an attempt to put some color to work for me. While that has helped, these paints are a gloss enamel, and they can be a source of glare, even on something as small as a front sight. I wanted to try something different this time. 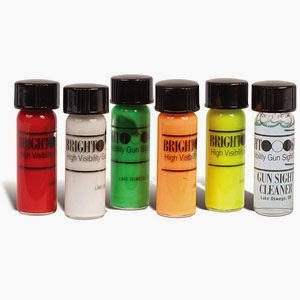 A little research via Google led me to the TruGlo family of products, and their Bright Sight Paint Kit, which I purchased from Amazon. Reading the Amazon reviews, it seemed to be a love it or hate it sort of thing, with negative reviews fixating on "The paint was thin" and interestingly enough, "It doesn't glow in the dark!" I remember thinking that while I had no idea about the first gripe, it didn't say anywhere in the item description that it was glow in the dark, so why would you think it was supposed to? I suppose the gun culture has to endure its share of derps. At any rate, once I had product in hand, I performed the obligatory check, check again and check AGAIN to be sure the gun was empty. Reading the extraordinarily brief instructions, I decided that my basement lair was a bit on the chilly side, so I arranged a small light bulb to provide some heat to the Ruger's slide, selected the orange color for my test and placed it in my pocket to warm. In the meantime, I got out my 91% rubbing alcohol and cleaned the front sight and surrounding area. Once satisfied the slide and paint were warmed, I did the triple check of the gun again, shook the paint thoroughly, opened it and carefully brushed on a coat. The reviewers were right, this stuff is thin. Very thin, somewhat thicker than muddy water. Being no stranger to painting (walls and houses, anyway), I decided that we would simply use as many coats as necessary to get the front sight to the level of color I wanted. The instructions say that the paint needs to dry 24 hours; more if possible. I allowed it to dry anywhere between 2 and 12 hours between re-coatings and gave it 4 coats in all before it reached the level of opacity I was seeking. The result was a nice orange sight. It is not, however, the bright orange of the paint in the bottle, but rather darker. It is also not a gloss finish, which I appreciate. In between coats, you can clean your brush with plain water. That's a nice touch I appreciate. Weather, work and family obligations have prevented a trip to the range, but I have had time for some dry-fire practice. I'm happy to report that the front sight is much easier to pick up, even in fairly low light and against light backgrounds. In more normal light and against outdoor backgrounds, it seems to make an equally big difference. I'm may also paint the rear sight a different color to see if the contrast improves my acquisition time. I haven't tried any of the other colors, but I'm looking forward to trying them on some other guns that need a bit of help in the sight department. For $21, it's a cheap enough thing that you can experiment with it. I expect from the nature of the product that it is not a "permanent" paint, which would make experimenting with it a simple matter, and the amount of paint you get ought to keep you busy experimenting for quite some time. I can even see this as a way to test out new sights before actually buying them--just paint up your existing ones to mimic the new ones. Over all, I recommend it. I don't remember seeing this many gun recalls, one after another, ever. This time, it's Remington's turn, with a recall for their Model 700 and Model Seven rifles. It seems that some of them could unintentionally discharge, making you one of the less popular guys amongst your hunting friends. If you have one, visit the link and see if it's one of the winners. Or losers.